Not to be confused with The Birds (band). The Byrds /bɜːrdz/ were an American rock band formed in Los Angeles, California in 1964. The band underwent multiple lineup changes throughout its existence, with frontman Roger McGuinn (known as Jim McGuinn until mid-1967) remaining the sole consistent member. Although they only managed to attain the huge commercial success of contemporaries like the Beatles, the Beach Boys, and the Rolling Stones for a short period in the mid-1960s, the Byrds are today considered by critics to be nearly as influential as those bands. Their signature blend of clear harmony singing and McGuinn's jangly twelve-string Rickenbacker guitar was "absorbed into the vocabulary of rock" and has continued to be influential. The original five-piece lineup of the Byrds consisted of Jim McGuinn (lead guitar, vocals), Gene Clark (tambourine, vocals), David Crosby (rhythm guitar, vocals), Chris Hillman (bass guitar, vocals), and Michael Clarke (drums). This version of the band was relatively short-lived; by early 1966, Clark had left due to problems associated with anxiety and his increasing isolation within the group. The Byrds continued as a quartet until late 1967, when Crosby and Clarke also departed. 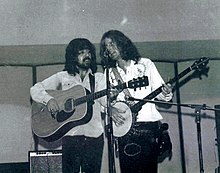 McGuinn and Hillman decided to recruit new members, including country rock pioneer Gram Parsons, but by late 1968, Hillman and Parsons had also exited the band. McGuinn elected to rebuild the band's membership; between 1968 and 1973, he helmed a new incarnation of the Byrds that featured guitarist Clarence White, among others. McGuinn disbanded the then-current lineup in early 1973 to make way for a reunion of the original quintet. The Byrds' final album was released in March 1973, with the reunited group disbanding later that year. Several former members of the band went on to successful careers of their own, either as solo artists or as members of such groups as Crosby, Stills, Nash & Young, the Flying Burrito Brothers and the Desert Rose Band. In 1991, the Byrds were inducted into the Rock and Roll Hall of Fame, an occasion that saw the five original members performing together for the last time. Gene Clark died of a heart attack later that year, while Michael Clarke died of liver failure in 1993. McGuinn, Crosby, and Hillman remain active. In August 1964, Dickson managed to acquire an acetate disc of the then-unreleased Bob Dylan song "Mr. Tambourine Man", which he felt would make an effective cover for the Jet Set. Although the band was initially unimpressed with the song, they began rehearsing it with a rock band arrangement, changing the time signature from 2/4 to a rockier 4/4 configuration in the process. In an attempt to bolster the group's confidence in the song, Dickson invited Dylan himself to World Pacific to hear the band perform "Mr. Tambourine Man". Impressed by the group's rendition, Dylan enthusiastically commented, "Wow, man! You can dance to that!" His ringing endorsement erased any lingering doubts that the band had over the song's suitability. By mid-1967, McGuinn had changed his first name from Jim to Roger as a result of his interest in the Indonesian religion Subud, into which he had been initiated in January 1965. The adoption of a new name was common among followers of the religion and served to signify a spiritual rebirth for the participant. 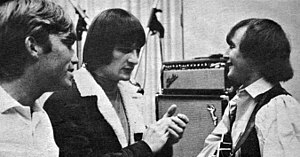 Shortly after McGuinn's name change, the band entered the studio to record the Crosby-penned, non-album single "Lady Friend", which was released on July 13, 1967. The Byrds' biographer Johnny Rogan has described "Lady Friend" as "a work of great maturity" and "the loudest, fastest and rockiest Byrds' single to date." Regardless of its artistic merits, however, the single stalled at a disappointing number 82 on the Billboard chart, despite the band making a number of high-profile television appearances to promote the record. Crosby, who had closely overseen the recording of the song, was bitterly disappointed by the single's lack of success and blamed Gary Usher's mixing of the song as a factor in its commercial failure. Following their stay in Nashville, the band returned to Los Angeles and throughout April and May 1968, they worked on completing their new country-oriented album. During this period, Parsons attempted to exert a controlling influence over the group by pressuring McGuinn to recruit either JayDee Maness or Sneaky Pete Kleinow as the band's permanent pedal steel guitar player. When McGuinn refused, Parsons next began to push for a higher salary, while also demanding that the group be billed as "Gram Parsons and the Byrds" on their forthcoming album. Even Hillman, who had previously been Parsons' biggest supporter in the band, began to grow weary of his forceful demands. Ultimately, Parsons' behavior led to a power struggle for control of the group, with McGuinn finding his position as band leader challenged. However, biographer Johnny Rogan has pointed out that the April 1968 release of "You Ain't Goin' Nowhere" served to strengthen McGuinn's position as head Byrd, with the guitarist's familiar drawl occupying the lead vocal spot and negligible input from Parsons, despite the single's obvious country leanings. With their new album now completed, the Byrds flew to England for an appearance at a charity concert at the Royal Albert Hall on July 7, 1968. Following the concert, just prior to a tour of South Africa, Parsons quit the Byrds on the grounds that he did not want to perform in a racially segregated country (apartheid did not end in South Africa until 1994). Hillman doubted the sincerity of Parsons' gesture, believing that the singer had in fact left the band in order to remain in England with Mick Jagger and Keith Richards of the Rolling Stones, whom he had recently befriended. Parsons stayed at Richards' house in West Sussex immediately after leaving the Byrds, and the pair developed a close friendship over the next few years. After leaving the Byrds, Parsons would go on to produce an influential but commercially unsuccessful body of work, both as a solo artist and with the band the Flying Burrito Brothers (which also featured Hillman). He died on September 19, 1973, at the age of 26, following an accidental overdose of morphine and alcohol in his room at the Joshua Tree Inn. The McGuinn–Hillman–White–Parsons line-up was together for less than a month before Hillman quit to join Gram Parsons in forming the Flying Burrito Brothers. Hillman had become increasingly disenchanted with the Byrds since the South African débâcle, and was also frustrated by business manager Larry Spector's mishandling of the group's finances. Things came to a head on September 15, 1968, following a band performance at the Rose Bowl stadium in Pasadena, when Hillman and Spector came to blows backstage. In a fit of rage, Hillman threw down his bass in disgust and walked out of the group. Following his exit, Hillman would have a successful career both as a solo artist and with bands such as the Flying Burrito Brothers, Manassas, the Souther–Hillman–Furay Band, and the Desert Rose Band. He remains active, releasing albums and touring, often with ex-Desert Rose Band member Herb Pedersen. The album was released on March 5, 1969 to generally positive reviews, but in America became the lowest-charting album of the Byrds' career, peaking at number 153 on the Billboard album charts. However the album fared much better in the UK, where it attracted glowing reviews and reached number 15. A number of tracks on Dr Byrds & Mr. Hyde, including the instrumental "Nashville West" and the traditional song "Old Blue", featured the sound of the Parsons and White designed StringBender (also known as the B-Bender), an invention that allowed White to duplicate the sound of a pedal steel guitar on his Fender Telecaster. The distinctive sound of the StringBender became characteristic of the Byrds' music during White's tenure. 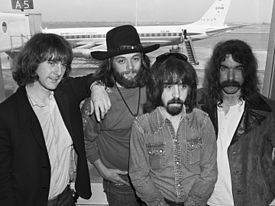 Left to right: Roger McGuinn, Skip Battin, Clarence White, Gene Parsons; the most stable and longest-lived of any Byrds line-up. Clarence White and Roger McGuinn on stage during the Byrds' September 9, 1972 appearance at Washington University, St. Louis, Missouri. Following Guerin's departure, he was temporarily replaced for live performances by session drummers Dennis Dragon and Jim Moon. The band underwent a further personnel change following a show of February 10, 1973 in Ithaca, New York, when Skip Battin was dismissed by McGuinn, who had capriciously decided that the bassist's playing abilities were no longer of a sufficient standard. McGuinn turned to ex-Byrd Chris Hillman, who at that time was a member of the band Manassas, and asked him to step in as Battin's replacement for two upcoming shows on February 23 and 24. Hillman agreed to play both concerts for the sum of $2,000 and also brought in Manassas percussionist Joe Lala to fill the vacant spot behind the drum kit. Following a shambolic, underrehearsed performance at the Capitol Theatre in Passaic, New Jersey on February 24, 1973, McGuinn cancelled the band's remaining concert commitments and disbanded the touring version of the Byrds, in order to make way for a reunion of the original five-piece line-up of the band. Five months later, guitarist Clarence White was killed by a drunk driver in the early hours of July 15, 1973, while he loaded guitar equipment into the back of a van after a concert appearance in Palmdale, California. 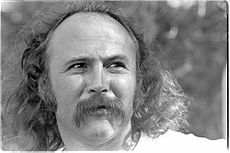 Following his dismissal from the band in 1967, David Crosby (pictured in 1976) was critical of Roger McGuinn's decision to recruit new band members, while continuing to use the Byrds name. McGuinn performing in 2009. Despite Hillman and Crosby's interest in future Byrds reunions, McGuinn remains reluctant to reform the band. To date, the Fred Walecki tribute concert appearance in 2000 was the last performance by the Byrds. However, Hillman and Crosby have both expressed an interest in working with McGuinn again on future Byrds projects, but the lead guitarist and head Byrd remains adamant that he is not interested in another full reunion. During an interview with music journalist John Nork, McGuinn replied "absolutely not," when asked if he had any plans to revive the Byrds, explaining, "No, I don't want to do that. I just want to be a solo artist. The Byrds are well documented. I don't think we need anymore from the Byrds." In spite of McGuinn's comments, he and Hillman undertook a series of concerts together in 2018 to celebrate the 50th anniversary of the Byrds' Sweetheart of the Rodeo album. Though not billed as the Byrds, the duo, together with backing band Marty Stuart and his Fabulous Superlatives, played some earlier Byrds' material before performing all of the songs from the album and telling stories about its creation. 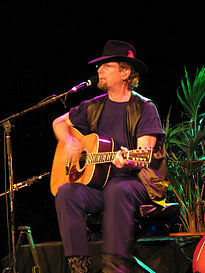 ^ Jim McGuinn changed his name to Roger McGuinn in 1967. ^ a b c d e f g h i j k l m n o Unterberger, Richie. "Biography of The Byrds". AllMusic. Retrieved May 25, 2010. ^ a b Ankeny, Jason. "Biography of Roger McGuinn". Allmusic. Retrieved May 25, 2010. ^ a b Ruhlmann, William. "Mr. Tambourine Man song review". Allmusic. Retrieved May 31, 2010. ^ a b c d e Ruhlmann, William. "Turn! Turn! Turn! song review". Allmusic. Retrieved May 31, 2010. ^ a b c Richie Unterberger. "Mr. Tambourine Man album review". Allmusic. Retrieved May 31, 2010. ^ "Folk-Rock Overview". Allmusic. Retrieved October 26, 2017. ^ "Psychedelic Rock Overview". Allmusic. Retrieved January 30, 2010. ^ a b c d Unterberger, Richie. "Biography of Michael Clarke". Allmusic. Retrieved May 25, 2010. ^ Russel, Richard E. "Roger McGuinn: Founder of The Byrds". Roger McGuinn Home Page. Retrieved May 26, 2010. ^ a b c d Ankeny, Jason. "Biography of David Crosby". Allmusic. Retrieved November 28, 2010. ^ a b c d e Rogan, Johnny. (1998). The Byrds: Timeless Flight Revisited (2nd ed.). Rogan House. pp. 52–55. ISBN 0-9529540-1-X. ^ McGuinn, Roger. "Byrds FAQ: What instruments did they play?". Roger McGuinn Home Page. Retrieved May 26, 2010. ^ McGuinn, Roger. "Byrds FAQ: How and When did they get together?". Roger McGuinn Home Page. Retrieved May 26, 2010. ^ a b c d Ankeny, Jason. "Biography of Chris Hillman". Allmusic. Retrieved May 26, 2010. ^ Unterberger, Richie. "Folk Rock: An Overview". Richieunterberger.com. Retrieved March 15, 2010. ^ Unterberer, Richie. "All I Really Want to Do song review". Allmusic. Retrieved January 21, 2011. ^ Unterberger, Richie. "Turn! Turn! Turn! album review". Allmusic. Retrieved June 1, 2010. ^ Greenwald, Matthew. "Set You Free This Time song review". Allmusic. Retrieved June 1, 2010. ^ a b c Deming, Mark. "Biography of Gene Clark". Allmusic. Retrieved May 25, 2010. ^ Unterberger, Richie. "Fifth Dimension album review". Allmusic. Retrieved June 24, 2010. ^ Erlewine, Stephen Thomas. "Pack Up the Plantation: Live! album review". Allmusic. Retrieved November 28, 2010. ^ Ruhlmann, William. "Wave album review". Allmusic. Retrieved November 28, 2010. ^ a b c Unterberger, Richie. "Younger Than Yesterday album review". Allmusic. Retrieved June 24, 2010. ^ Ward, Thomas. "Everybody's Been Burned song review". Allmusic. Retrieved January 20, 2011. ^ "The Byrds' Greatest Hits RIAA Awards". Recording Industry Association of America. Retrieved November 1, 2010. ^ Unterberger, Richie. "The Notorious Byrd Brothers album review". Allmusic. Retrieved January 8, 2011. ^ Deming, Mark. "Goin' Back song review". Allmusic. Retrieved January 8, 2011. ^ Eder, Bruce. "Crown of Creation album review". Allmusic. Retrieved June 27, 2010. ^ a b c "David Crosby: Bio". David Crosby Home Page. Archived from the original on March 4, 2012. Retrieved April 3, 2012. ^ Erlewine, Stephen Thomas. "Biography of Gram Parsons". Allmusic. Retrieved November 9, 2010. ^ a b Deming, Mark. "Sweetheart of the Rodeo album review". Allmusic. Retrieved November 9, 2010. ^ Erlewine, Stephen Thomas. "Nashville Skyline album review". Allmusic. Retrieved November 9, 2010. ^ Deming, Mark. "Dr. Byrds & Mr. Hyde album review". Allmusic. Retrieved November 23, 2010. ^ Greenwald, Matthew. "Nashville West song review". Allmusic. Retrieved January 16, 2011. ^ a b Ruhlmann, William. "Easy Rider: Original Soundtrack album review". Allmusic. Retrieved June 27, 2010. ^ "Untitled". Snopes.com. Retrieved January 8, 2011. ^ a b Leggitt, Steve. "Live at Royal Albert Hall 1971 album review". Allmusic. Retrieved January 16, 2011. ^ Leggett, Steve. "Live At Royal Albert Hall 1971 album review". Allmusic. Retrieved January 11, 2011. ^ Hartenbach, Brett. "Chestnut Mare song review". Allmusic. Retrieved January 11, 2011. ^ a b c Deming, Mark. "Byrdmaniax album review". Allmusic. Retrieved January 16, 2011. ^ Deming, Mark. "Farther Along album review". Allmusic. Retrieved January 18, 2011. ^ Hjort, Christopher (2008). So You Want to Be a Rock 'n' Roll Star: The Byrds Day-by-Day (1965–1973). London: Jawbone Press. p. 321. ISBN 1-906002-15-0. ^ Eder, Bruce. "McGuinn, Clark & Hillman Biography". AllMusic. Retrieved April 19, 2011. ^ a b c d Baltin, Steve. "Byrds Reunite for L.A. Show". Rolling Stone. Retrieved April 29, 2011. ^ Bleetstein, Rob. "Byrds Reunion Caps Star-Studded Benefit". VH1. Retrieved April 29, 2011. ^ "Kevin Kelley Obituary". Los Angeles Times. May 2, 2002. Retrieved April 24, 2011. ^ Varga, George. "CD Proves to Everything There Is a Season". The San Diego Union-Tribune. Retrieved April 25, 2011. ^ "Byrds Co-Founders Plan 'Sweetheart of the Rodeo' 50th Anniversary Tour". Rolling Stone. Rolling Stone. Retrieved June 5, 2018. ^ BrooklynVegan Staff. "Byrds members played 'Sweetheart of the Rodeo' & more at Town Hall (pics, setlist)". BrooklynVegan. Town Square Media. Retrieved September 25, 2018. ^ Hoard, Joel. "The Byrds Biography". Rolling Stone. Retrieved April 25, 2011. ^ Petty, Tom. "100 Greatest Artists of All Time - No. 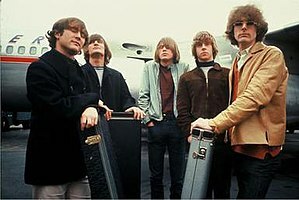 45: The Byrds". Rolling Stone. Retrieved April 26, 2011.